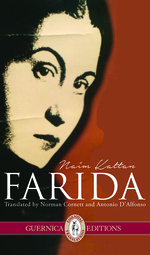 In a recent interview interview with Rana Alrabi from CKUT, Naim Kattan and Norman Cornett speak about Farida, Naim Kattan’s fifth novel to be translated into English. They discuss the life of Naim Kattan, the main themes of the novel, and the commentary which these themes provide on universal topics and issues. The English translation of Farida by Naim Kattan trans. Norman Cornett and Antonio D’Alfonso was published by Guernica Editions in Spring 2015. Naim Kattan speaks about his experiences in the three cities where he’s lived throughout his life: Baghdad, Paris and Montreal. He begins by describing his early life in Baghdad— a city which, before the Second World War, was largely multicultural and multiethnic. Furthermore, Naim Kattan and Prof. Cornett point to the ways in which Farida explores feminism. He explains that this concern is central to the Middle East, but not only— the importance of promoting Feminism is universal, and crucial in countries across the world. He elaborates on the role which Farida plays in bringing these issues to light. Moreover, Kattan and Cornett stress the crucial role of the English translation of Farida in opening up dialogue about feminism, multiculturalism and multilingualism to a wider audience. In the end, the novel voices the importance of humanity, and of the ability to coexist with others. Tagged with CKUT, Farida, Naim Kattan, Norman Cornett, Rana Alrabi.